Tuesday, May 22, 2018, 7 – 8 p.m. The book is currently in stock at all three TPB in the Seattle area and it is available for purchase https://www.thirdplacebooks.com/StoriesSleep. All profits go to Tostan, an award-winning human rights based nonformal education program working across six West African countries. Their results include, among many others, empowering women to run for local political offices, leading communities to abandon harmful practices such as Female Genital Cutting and Child Marriage, and preserving and nurturing positive social practices that create healthy, harmonious communities. Needless to say, there is great demand for this program. Diane Gillespie is Emerita Professor in the Interdisciplinary Arts and Sciences Program at the University of Washington Bothell and volunteer for the nonprofit Tostan. 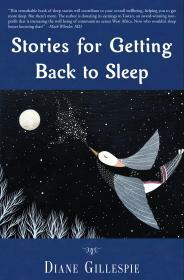 Stories for Getting Back to Sleep is her first venture into self-help fiction. Struggling herself, she created these stories as a strategy for falling back to sleep. She lives in Seattle, Washington and enjoys spending time with family and friends. Please see HERE>> for more information.